Superb sound. Membrane model is a blast. Works brilliantly as a pitched synth too. Great value for money. No sample import. Some version 1 features (temporarily) lost. Stalls in switching to Logic's generic GUI. Like its predecessor, DrumSpillage 2 is an Audio Units plugin for Mac with a focus on electronic percussion, both retro-styled and contemporary. 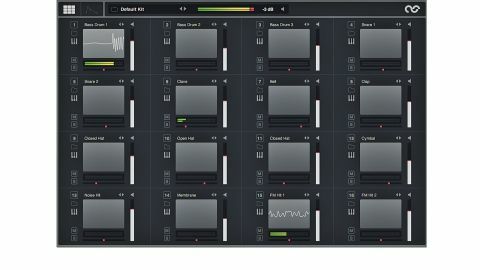 "The new incarnation expands on version 1 with a redesigned GUI and new effects modules"
The new incarnation expands on version 1 with a redesigned GUI, more LFOs, new filter and distortion algorithms, velocity control and a couple of new effects modules. It boasts a dozen individual drum models capable of producing a wide range of sounds, from classic analogue kicks and snares to woody hits, metallic FM timbres and vibrant membranes. The interface works around two main editing modes. The first is the Pad Editor, a 4x4 grid of drum pads, the layout of which can be switched between Spillage and MPC/Maschine grids. In Spillage mode, C1 is mapped to the top-left pad, and the scale ascends from left to right down through the rows; the MPC/Maschine version starts at the lower-leftmost pad and works its way across and up from there. Each pad is surrounded by controls for preset loading/saving, mute, solo, volume and pan, and pads can be copied, pasted and moved by dragging and dropping. Clicking the pad itself triggers its loaded sound, of course, and you can enter the Model editor directly from a pad or via a button at the top of the GUI. The Model editor is where all the real action takes place, presenting a full set of sound-shaping controls for the selected pad and enabling you to choose from the 12 DrumSpillage 2 models. Most functions are available no matter which model is loaded, starting with pan, output selection, volume, peak meter, pad name (editable) and Polyphony on/off. There's also a common set of pitch/ frequency controls: Transpose, Pitch Env and Presence, the last adding a bit of heft to bass frequencies and sizzle to highs. A multimode filter is onboard, sharing a tabbed pane with the Distortion, Resonator - a three-band comb filter designed with metallic timbres in mind - and Frequency Shifter effects modules. Each pad gets four LFOs that can be assigned to various model-dependent destinations, as well as the Transpose parameter, effects and each other (LFO FM). Further modulation is on hand in the shape of Pitch, Amp and Aux envelope generators, along with a modulation step sequencer (Stepper). Selecting one of DrumSpillage's 12 models brings up a tailored set of functions specific to it, alongside all the universal parameters listed above. There are two bass drum models - one with FM and ring modulation, the other packing a noise generator with its own resonant filter. The Snare model is very much of the analogue variety, complete with noise, filter and x0x-style Snap setting. The Wood model barks out a range of unusual tones with its three oscillators and dual filter controls, the classic Clap model uses noise and a complex envelope to create vintage handclaps, and a band-pass filter and dual oscillators form the core of the Clave model. A Cowbell is, of course, also included, as are Hi-Hat and Cymbal models, all with the requisite metallic flavours. "It's DrumSpillage 2's knack for synthetic effects that most impresses"
Perhaps more interesting is the Noise Synth model, with its quartet of noise generators and band-pass filters. Yet even that pales in comparison to the wicked three-osc FM Percussion model, which produces everything from crispy kalimbas to sustained metal gongs. Finally, the Membrane model presents 12 oscillators in four banks to mimic the behaviour of a set of suspended plates. Each model delivers the goods. Kick drums range from deep, resonating booms to sharp, gritty clicks. Snares crack and snap, veering towards authenticity or outlandishness - your choice. Hi-hats tick and hiss, and cymbals sizzle nicely. However, it's DrumSpillage 2's knack for synthetic effects that most impresses. From glitchy crickets, spacey gurgles and razor-sharp zaps and blasts to subtle chirps, hums and beeps, it's a broad electronic palette that will appeal to experimental electronica heads as well as those building more conventional beats. We like DrumSpillage 2 a lot, but it isn't without its flaws. We could consistently stall Logic Pro X simply by switching between the DrumSpillage GUI and Logic's generic control panel, the changeover taking an absolute age to happen. There's also no built-in pattern sequencer, and we can't help but wish that there were a means by which to load samples into the thing - although, to be fair, that would rather encroach on AudioSpillage's other drum machine, Elecktroid. More troubling than those omissions, though, are the features that have actually been lost between versions 1 and 2, such as the ability to export pads as samples, and the randomisation function that gave the modelled sounds a bit of 'human' variation between hits. Apparently, these will be returning in an update at some point, but right now, they're definitely missed - roll on v2.1, we say. Niggles aside, DrumSpillage 2 is a percussion powerhouse that comes in at a great price. It's supremely versatile and sonically first-class, and while it may not be the only drum machine you'll ever need, it provides an original and useful toolset with which to make truly inspiring noises.